Deep South Containers provides a full line of top quality Self Contained and Stationary Compactors. Our waste compactors are built to withstand high volume and heavy duty industrial applications. Self contained waste compactors feature liquid tight containment providing a clean method to handle most any type of trash and is perfect anywhere liquid is part of the waste being disposed. Our self contained compactors are designed to store and transport your waste while preventing contamination of public areas in accordance with public health department requirements, improve working conditions for your employees, and most importantly reduce disposal costs. Our self contained compactors are fully sealed and help prevent leakage and odor problems. They are available in a variety of sizes. 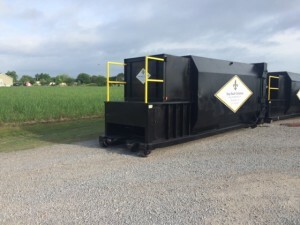 Stationary waste compactors compress waste to cut down on the number of pick-ups associated with waste removal while cutting the environmental effects of transporting the waste to and from the land-fill. Our stationary compactors come in a variety of sizes to solve your compaction needs and are designed for a diverse group of commercial and industrial applications. These compactors are typically used for dry, industrial waste. Contact us to speak with a waste collection professional about receiving your Compactor from Deep South Containers today. To request service please click on the link below to be directed to our contact page.